As he had a great deal of spirit and imagination, and a strong voice, he became a popular preacher in the chief cities of France. He acquitted himself in the pulpit with uncommon vivacity, and had a peculiar turn for the wit then in vogue, which, being enforced by a suitable delivery, made deep impressions upon his audience. But he was not content with the honour he thus did to his order. His ambition led him to aim at being more extensively serviceable by his writings. With that spirit, while yet in his noviciate, he published in 1614 a defence of the Jesuits against three of their adversaries at once. 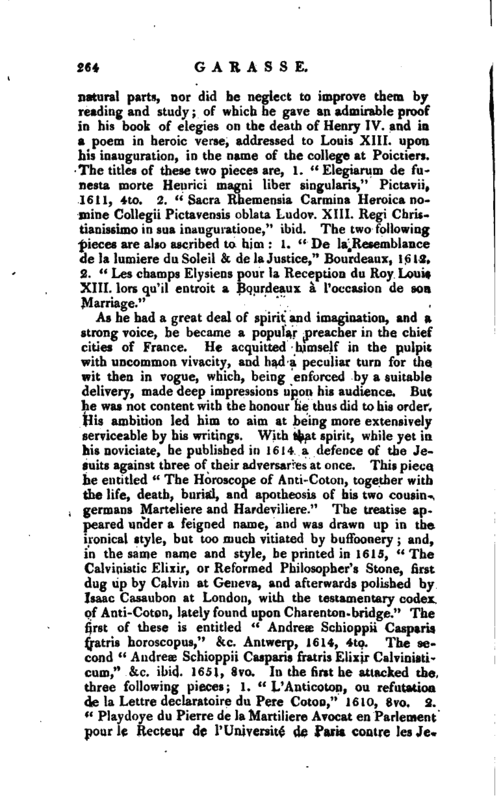 This piece he entitled “The Horoscope of Anti-Coton, together with the life, death, burial, and apotheosis of his two cousingermans Marteliere and Hardeviliere.” The treatise appeared under a feigned name, and was drawn up in the ironical style, but too much vitiated by buffoonery; and, in the same name and style, he printed in 1615, “The Calvinistic Elixir, or Reformed Philosopher’s Stone, first dug up by Calvin at Geneva, and afterwards polished by Isaac Casaubon at London, with the testamentary codex of Anti-Coton, lately found upon Charenton-bridge.” The first of these is entitled “Andrew Schioppii Casparis fratris horoscopus,” &c. Antwerp, 1614, 4to. The second “Andres Schioppii Casparis fratris Elixir Calvinisticum,” &c. ibid. 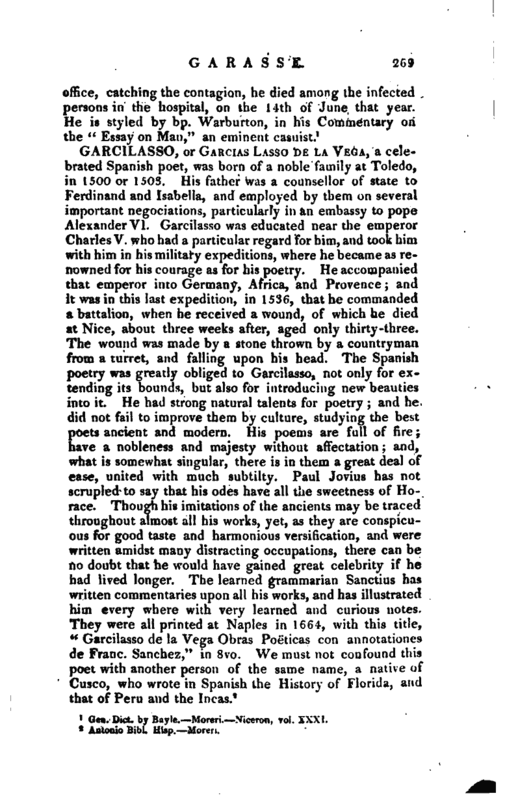 1651, 8vo. In the first he attacked the three following pieces; 1. “L’Anticoton, on refutation de la Lettre declaratoire du Pere Colon,” 1610, 8vo. 2. “Playdoye du Pierre de la Martiliere Avocat en Parlement pour le Recteur de l’University de Paris contre lesJe-r | suits,” Paris, 1612, 8vo. 3. “Petri Hardovilierii Actiopro Academia Parisiensi adversus Presbyteros & Scholasticos Collegii Claromontanii habita in Senatu Parisiensi. ann. 1611,” Paris, 1612, 8vo. Niceron observes, that our author’s satirical style was very like that of the famous Schioppius, which was apparently the reason of his chusing that mask, which suited him exactly well. 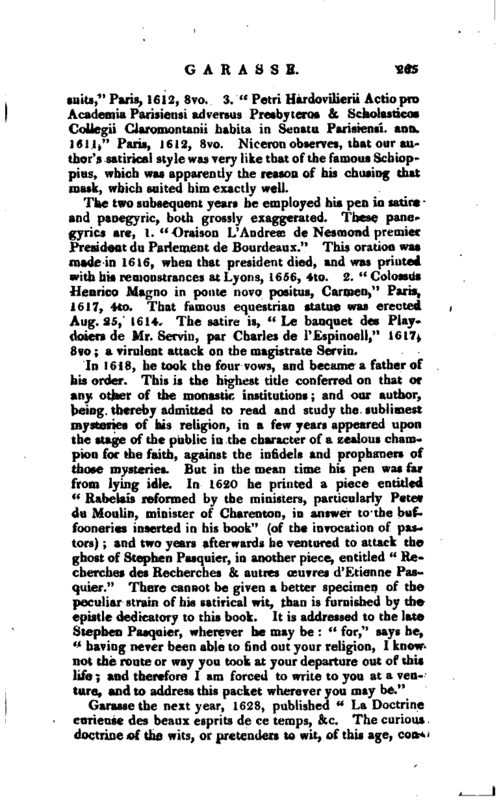 The two subsequent years he employed his pen in satire and panegyric, both grossly exaggerated. These panegyrics are, 1. “Oraisou L’Andrese de Nesmond premier President du Parlement de Bourdeaux.” This oration was made in 1616, when that president died, and was printed with his remonstrances at Lyons, 1656, 4to. 2. “Colossus Henrico Magno in ponte novo positus, Carmen,” Paris, 1617, 4to. That famous equestrian statue was erected Aug. 25, 1614. The satire is, “Le banquet des Playdoiers de Mr. Servin, par Charles de PEspinoell,” 1617, 8vo a virulent attack on the magistrate Servin. By the same method our author was also reconciled to Balzac, with whose character he had made free, having provided a seat, for him among the atheists of the times. The “Doctrine Curieuse,” carried the strongest marks of a most busy and active temper; vivacity was the characteristic of the author, and he had no sooner escaped the difficulties which that treatise brought upon him, but he plunged into another, of a much more threatening aspect. This was created by a book he published in 1625, under the title of “La Somme Theologique des verites capitales de la religion Chretienne.” It was this book which first excited the war between the Jansenists and the Jesuits, and in the following manner. The abbot of St. Cyran, observing in Garasse’s book a prodigious number of falsifications of Scripture and the fathers, besides many heretical and impious opinions, thought the honour of the church required a refutation of them. Accordingly, he wrote an answer at large, in four parts. But while the first part was in the press, the noise it every where made occasioned Garasse’s book to be more carefully examined. March 2, 1626, the rector of the Sorbonne declared before that society that he had received several complaints of it; and, proposing to have it examined, a committee was appointed for that purpose, who should give their opinion of it on the 2d of May following. 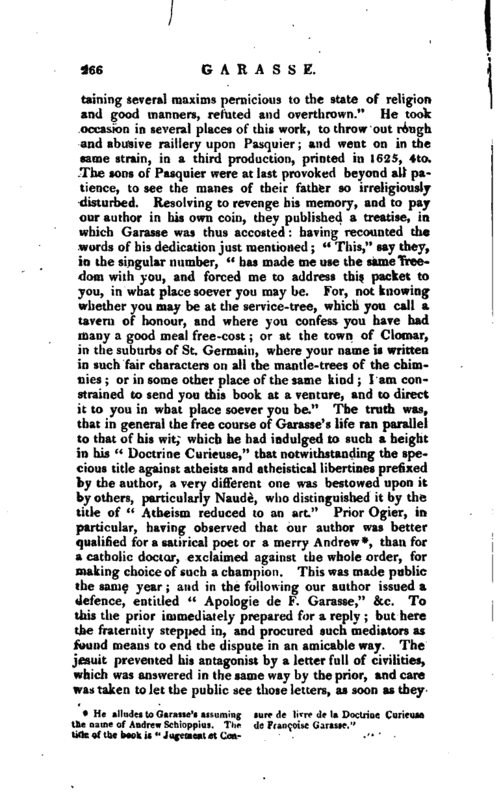 This matter alarming Carasse, he presently after this appointment published at Paris, “L’abus decouverte,” &c. In this piece he drew up a list of 111 propositions the most easy to maintain that he could find, and having composed a censure of them, which he pretended was that of the abbot St. Cyran, he refuted that answer with ease. 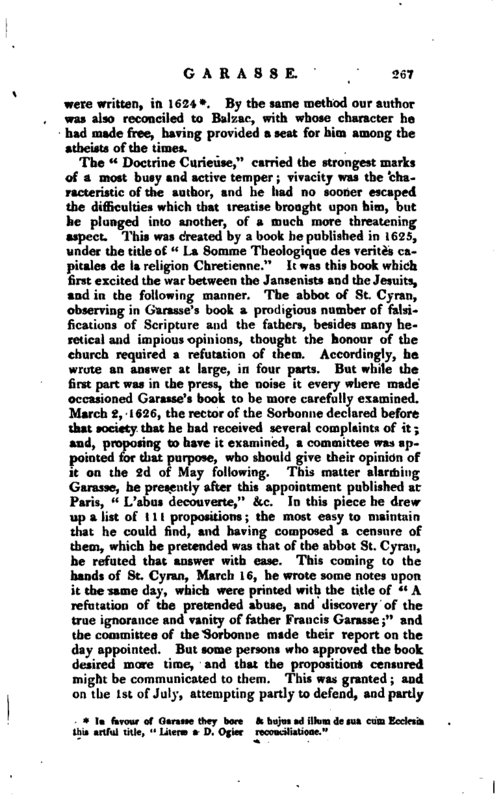 This coming to the hands of St. Cyran, March 16, he wrote some notes upon it the same day, which were printed with the title of “A refutation of the pretended abuse, and discovery of the true ignorance and vanity of father Francis Garasse;” and the committee of the Sorbonne made their report on the day appointed. But some persons who approved the book desired more time, and that the propositions censured might be communicated to them. 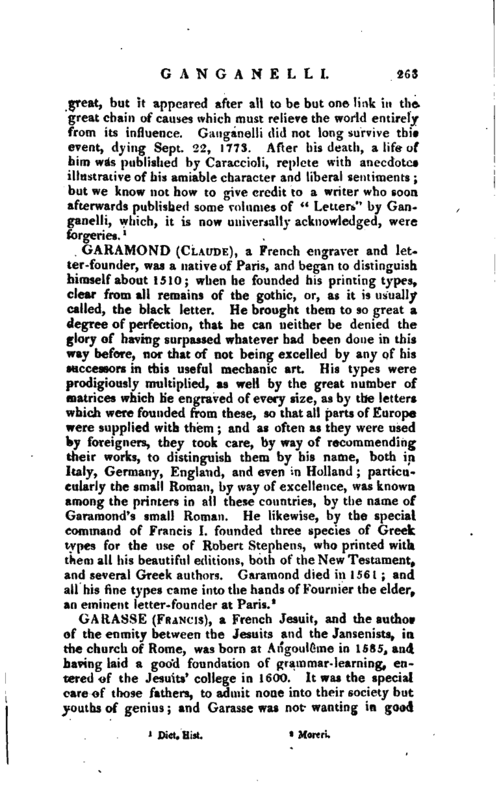 This was granted; and on the 1st of July, attempting partly to defend, and partly | to explain it, they found themselves under a necessity of confessing that there were some passages in it which could not be excused; and that F. Garasse had promised to correct them, without performing his promise. 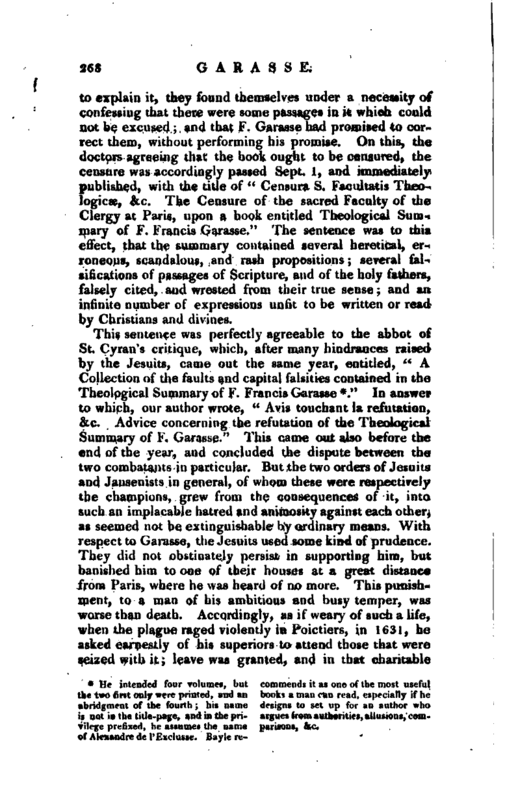 On this, the doctors agreeing that the book ought to be censured, the censure was accordingly passed Sept. 1, and immediately published, with the title of “Censura S. Facultatis Theofogicse, &c. The Censure of the sacred Faculty of the Clergy at Paris, upon a book entitled Theological Summary of F. Francis Garasse.” The sentence was to this effect, that the summary contained several heretical, erroneous, scandalous, and rash propositions; several falsifications of passages of Scripture, and of the holy fathers, falsely cited, and wrested from their true sense; and an infinite number of expressions unfit to be written or read by Christians and divines. He intended four volumes, but the two first only were printed, and an abridgment of the fourth; his name is not in thw title-page, and in the privilege prefixed, he assumes the name of Alexandre de l’Exclusse. —Bayle re commends it as one of the most useful books a man can read, especially if he designs to set up for an author who argues from authorities, allusions, comparisons, &c.
Geq. Dict. by Bnyle. Moreci, Nitron, vol. XXXI.